Despite the name, and many similar duties, military police are more than just cops in camouflage. The name can be deceiving. Military Police (MP) (known as Master-at-Arms (MA) in the Navy, and Security Forces Specialist in the Air Force) are employed at every major base and installation to protect people and property and enforce the law — ​military law, that is, the Uniform Code of Military Justice. Their jurisdiction is limited to military property and personnel. They’re usually most visible manning gates and security checkpoints, and enforcing basic traffic laws and military regulations. But their duties also include investigating felony-level crimes and terrorism, and coordinating with other law enforcement agencies when service members get themselves in a mess out in town. Things change overseas, where MPs stop writing traffic tickets and start running combat operations. Still protecting lives and property, they’re usually the standing security team for motor convoys through hostile territory -– providing lead, rear, and roving vehicles to the column –- with an obviously more lenient “jurisdiction,” since they’re operating as infantry. They may also train and coordinate with local police and security, as in Afghanistan and Iraq after the US-led invasion of those countries left their law enforcement systems –- well, non-existent. Clear speaking ability is mentioned specifically by Air Force and Marine requirements, but is surely necessary for any branch, since MPs communicate with offenders, bystanders, and lawyers regularly. Army: Applicants must be at least 18 years old and get a Skilled Technical score of 91 on the Armed Services Vocational Aptitude Battery (ASVAB). Navy: To get the Master-at-Arms rating, you must be a born or naturalized citizen of the United States and eligible for a Secret clearance. On the ASVAB, applicants need a Word Knowledge score of at least 43, and a total of 95 points from Word Knowledge and Arithmetic Reasoning. Air Force: For Security Forces, you’ll also need to be eligible for a Secret clearance. The Air Force also recommends high school courses in government, behavioral science, computer, and communication skills. Marine MPs must be US citizens who’ll reach age 19 before they finish Military Occupational Specialty (MOS) school and score at least 100 in the General Technical category of the ASVAB. The Corps also has a “this tall to ride” sign for MPs: For unspecified “safety reasons,” Marines shorter than 64 inches (5’ 4) are barred from the MOS without hope of a waiver. 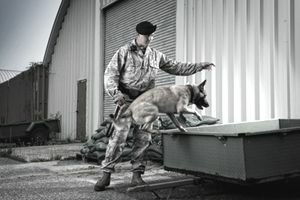 No matter the course, you can expect military law enforcement training to include managing traffic, criminal investigations, prisoner handling, and riot control, as well as covering unique military subjects like crew-served weaponry, Military Operations in Urban Terrain (MOUT), and the laws of war. Army training for new recruits takes place at Fort Leonard Wood, Missouri, and lasts 20 weeks. It includes basic training and combat training on top of actual classroom and on-the-job instruction for the MOS. The Marines also send their MPs to the Army’s schoolhouse at Ft. Leonard Wood, but since they’ve already graduated their own boot camp and combat training, they only attend the Basic Military Police Course for three months. Marines share bunks at the Leonard Wood Marine Detachment with students training at other Army schools to become motor transport operators, chemical/biological/radiation/nuclear defense technicians, and engineers. Navy Masters-at-Arms students attend 45 days of training at Lackland Air Force Base, Texas. Air Force Security Force students also go to school at Lackland, but for approximately three months. Visit Army Credentialing Opportunities On Line (COOL) to see certification and licensing opportunities for Military Police (MOS 31B) or Navy COOL for the Master-at-Arms rating. The Air Force Credentialing and Education Research Tool suggest certifications for the Security Forces Technician (3P0X1) as well as the Criminal Justice program at Community College of the Air Force. Additionally, Navy MAs and Marine Corps MPs may be eligible for apprenticeships as government police officers or security specialists through the Department of Labor’s United Services Military Apprenticeship Program.